We eliminate the overwhelm of decorating a house and instead create a space you love coming home to! Berniel's cozy home round up! Whenever I would come back from college and go home, I remember walking into the front door and it felt soo good. I was home. I was on no longer fending for myself! But I was so happy I was home. It was a feeling only your home could grant you. I know you all know what I’m talking about. It’s the comfort of the little familiar things that didn’t seem important until you lived with out them. 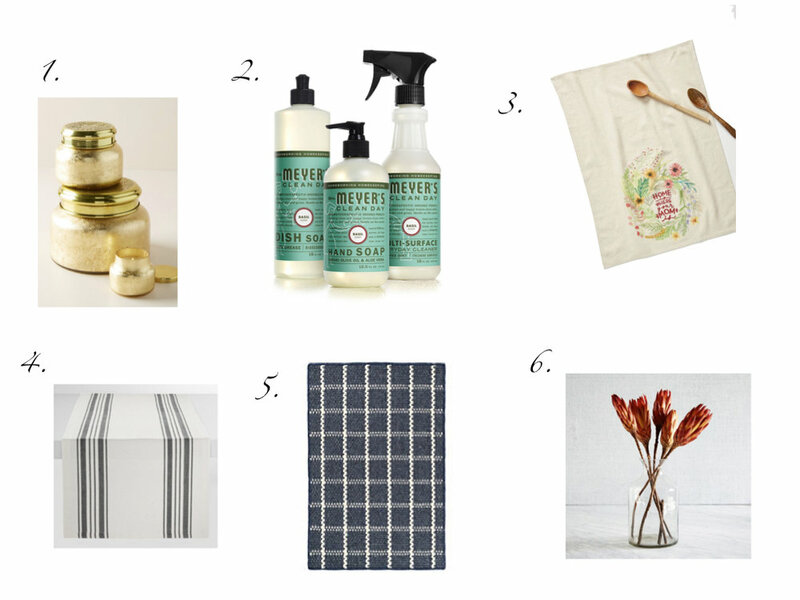 I rounded up a list of my mom’s favorites things that kept her home feeling fresh and welcoming. My mom (Berniel) was so good at making you feel like you were a part of her home. Mostly it was just her love that you felt when you were in her home. Now that my mom is gone, walking into her home is still one of the hardest things I do. We all miss her like crazy especially this time of year. But I am forever grateful for her teaching me how to turn my house into home where everyone feels welcomed and loved. OK! Here is a round up of Berniel’s Top Cozy essentials for your kitchen ! Ladies- you have to keep a fresh rotation on your dish towels. All the ones that look tired and stained- retire them! A bright clean dishtowel hanging on your sink or over your oven will bring a simple pleasure to your soul every time you pause to look at it. I promise! Because we lived on a farm we had a lot DIRT that would make its way in our home. Usually that meant sweeping the floor multiple times a day. Therefore my mom had a lot of rugs to help with the lovely dust. She changed them out about every 6 months. I loved it when my mom got new rugs for her kitchen. It always made the kitchen feel warm grounded. My mom had a long island that would always be dressed with a runner. Every season should she would change them up. I love this little touch she would do. It just made the kitchen feel pretty. Really? Yes. When you have a dish soap that smells as pretty at it looks- It’s a GAME CHANGER. Doing dishes becomes an entirely new experience. Go get your self a little plant or in my case something fake and put it by your sink. Can you tell that I’m really good at tricking my self into doing the dishes. They have to be done right? So why not smell and look at pretty things while you are doing them! Have a great weekend! Hope this list helps in making your home feel a little bit more cozy this holiday season! The ones pictured below are some of my favorites this year! Links above.